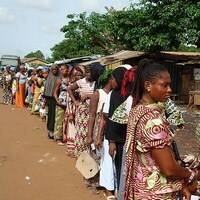 CONAKRY, Guinea — Guineans at home and abroad finally went to the polls on Sept. 28 to elect 114 members of parliament. Despite multiple delays and a series of demands from the opposition for fair political competition, preliminiary results suggest that President Alpha Conde’s ruling Rally of the Guinean People (RPG) party won a relative majority, thus solidifying the gains made during Conde’s first three years in power and further intensifying the rivalry between the country’s different political factions. However, the opposition Union of Democratic Forces of Guinea (UFDG) coalition has disputed the early results and withdrawn from the vote-counting process in protest. So while Guinea’s transition is now officially over, much remains to be done in terms of political dialogue ahead of the 2015 presidential ballot.